Who says there are no second acts in American lives? Twenty years after his most recent case (The Man Who Loved Women to Death, 1997, etc. 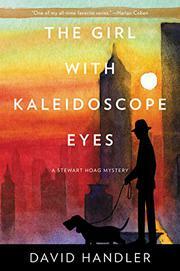 ), celebrity-biography ghostwriter Stewart “Hoagy” Hoag runs into more murders in 1992 Hollywood. One-novel wonder Richard Aintree hasn’t exactly shone as a family man. The day after the funeral of his wife, Eleanor, a Pulitzer-winning poet who jumped off their roof while high on LSD, he vanished, and his daughters have seen nothing of him in the 20 years since. Now he’s written to his daughter Monette, a tell-all novelist who’s morphed into a lifestyle brand queen, telling her he’s ready to tell his story if she’ll just make the arrangements with Hoagy and his literary agent, Alberta Pryce. The promise of a fat kill fee even if Richard’s book never appears lures Hoagy and Lulu, his basset hound, out to the West Coast, and shortly after his arrival, he finds that Monette’s sister, Regina, Hoagy’s long-ago lover, has made the trip from New York as well. The sisters bond unexpectedly over the 17th birthday party of Joey, Monette’s truculent son: their relationship is a lot more cordial than Monette’s reunion with her estranged husband, TV star Patrick Van Pelt, and his pregnant 19-year-old co-star and mistress, Kat Zachry. While the assembly waits for further word from the absent father, they amuse themselves by scoring drugs, admiring each other’s bodies, and presenting Joey with a most unexpected birthday gift. When the inevitable murder follows, Hoagy is on hand to talk nice to Lt. Emil Lamp, the LAPD’s specialist in celebrity homicide, until he can sort out a plot with nearly as many moving parts as Murder on the Orient Express. The set pieces, from the killing to the denouement, feel staged and forced, but the characters and dialogue don’t disappoint, and the sorely missed hero’s mixture of cynicism and sweetness plays as well as ever.